Experience Life at Moody Gardens, Galveston Island! Work or play, the tropical splendor surrounds you in this little piece of paradise! Moody Gardens features a variety of unique attractions, a 4-diamond hotel, spa & convention center and an 18-hole seaside-links golf course. Stay connected with us for the latest updates, giveaways and exclusive behind-the-scenes look at Moody Gardens. Be sure to share your #MGMemories with us through pictures, videos or comments. 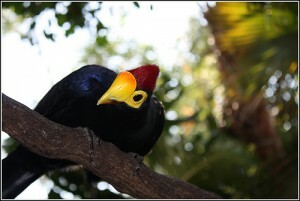 Moody Gardens is thrilled to have these playful and interesting birds free-roaming inside the Rainforest Pyramid when Rainforests of the World opens in May 2011. Check out the video and read the fun facts to learn more about this amazing species! Click here to watch the Lady Ross’ Turaco Video! Turacos are a food source for many animals larger than themselves. They are so abundant in Africa that they are considered a pest. Their feeding habits are very destructive, which annoys most gardeners. However, they aid in seed dispersal by messily eating fruit. They also eat berries that are considered highly poisonous to humans. Turacos are the only birds to possess true red and green color. When you look at most birds, the color you are seeing is a reflection produced by the feather structure. The turaco’s red and green pigment both contain copper. In fact, if you stirred a glass of water with a red turaco feather, the water would turn pink! Lady Ross’s turacos are very social birds, moving in small noisy flocks. They spend their life among trees in search of fruit until evening when they nest solitary on a platform of twigs. These birds have mobile outer toes, which they are able to rotate forward or backward! Previous Previous post: RAINFOREST PYRAMID VIDEO UPDATE: Welcome home Scarlet Ibis! Next Next post: Love is in the air at Moody Gardens!